Next to a Scorpio you feel intrigued, but your relationship can be challenging. You finish before you start, you imagine such fabulous projects that get you tired before starting. If you want to be with a Scorpio, you'll have to work hard; running here and there, which is quite normal for a Gemini. 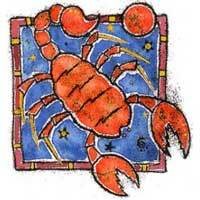 Scorpio influences aspects related to work, employees, animals, health and career. This native will raise your awareness concerning your health and work, and alongside Scorpio you can become a very helpful person. Gemini natives usually trust other people, but in this situation Scorpio is the one who trusts you with a new project, and as you start working you begin to complain and revolt. It is not an easy relationship, because what Scorpio is missing is Gemini's energy. There's a steady influence, from which you can take profit but you have to be patient. Scorpio determines you to finish what you started, and this is basically a good thing. Gemini natives figure out that they cannot fly away without having completed a cycle- that is- until they finish the project they are working at. Every time Gemini is doubtful, Scorpio is the one to make things clearer for them. Pluto and Mercury will give you the possibility to establish long term goals, and although you can change your mind anytime, you know where you'll end up.